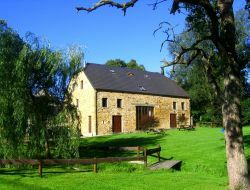 Nearby: Bouillon - Rochehaut - Dinant - St Hubert - Bastogne - Sedan - Charleville-Mézière - Reims..
At the gates of the Belgian Ardennes, 20 km from Liege and Spa [Sprimont], rental of holiday cottages of charm in the outbuildings of square farmhouse XVII. Cottage for a group of 23 people, 16 people, 12 people - 11, 8 and 6 bedrooms. For your family holiday in a very quiet .... 2x6 or 10 people - 2x3 and 10 rooms.